The Kodak Zi8 Video Camera is one of the very few portable camcorders that is capable of true 1080p quality video, making it an excellent value for a price of less than two hundred dollars. With its respectable range of features, the Zi8 surpasses the popular Flip cameras in more ways, scoring a major victory for Kodak. With image resolution selectable in quality all the way up to 1080p, the Kodak Zi8 Video Camera offers users the best quality possible in a personal camcorder. With video quality this high, the only way to truly view it in full is via a direct connection with a high definition television, which can sometimes be a burden when dealing with navigation due to wired technology. Kodak remedies this problem, however, with an optional wireless controller. The remote control that is available for purchase separately can not only help users navigate through video files comfortably from afar, but can also be used to control recording features of the device. With a tripod setup, for example, buyers can use the remote control to hit record from a distance for family photos or unique video projects. The control itself is relatively expensive, costing around fifteen dollars. One of the most unique features included on the Kodak Zi8 Video Camera is its external microphone jack. While most portable video devices are stripped down, bare bones units designed to provide high quality at a low price, the Zi8 goes the extra mile and allows users to connect a decent mic and avoid the dull, weak audio so common with small camcorders. The Kodak Zi8 Video Camera includes an image stabilization feature but, due to the nature of the device itself, “shaky cam,” is very common for the unit. A tripod can be used to help counteract the effects of the shaky handheld look, but this almost defeats the purpose of a portable digital camcorder. The unit includes only a minimal amount of memory for storage of video and imagery. An SD card slot is available for memory add ons, but no SD card is included in the initial purchase, though it is, more or less, essential. The software included is also essential for smooth playback of 1080p video, but it is not Mac compatible, which severely limits the device’s appeal to a broad range of buyers who edit video exclusively on a Macintosh using the popular Final Cut software. I got this camera because I was about to become a Dad. I really like the explandable SD card slot and the attached USB Cable. The quality of the 1080p mode is comparable to high end HD cameras when you're shooting in direct sunlight. Very good camera for the price. 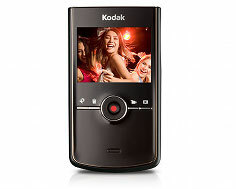 A variety of accessories are available for the Kodak Zi8 Video Camera, including the convenient remote control. Also available is a selection of protective cases that can not only prevent some damage to the device in the event of a drop, but can also reduce the common finger print smudges that the unit’s clear front is susceptible to. The Kodak Zi8 Video Camera can also accept a standard SD card for large quantities of on board storage and easy transfers of data to a PC or Mac. SD cards are widely available and the Zi8 accepts cards up to 32 GBs in size.